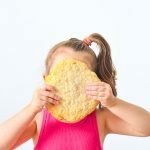 I wrote this Cinnamon Sugar Tortilla Chips Recipe/blog post while participating in the Kids II Blogger Campaign and received monetary compensation and/or free products to facilitate my review. 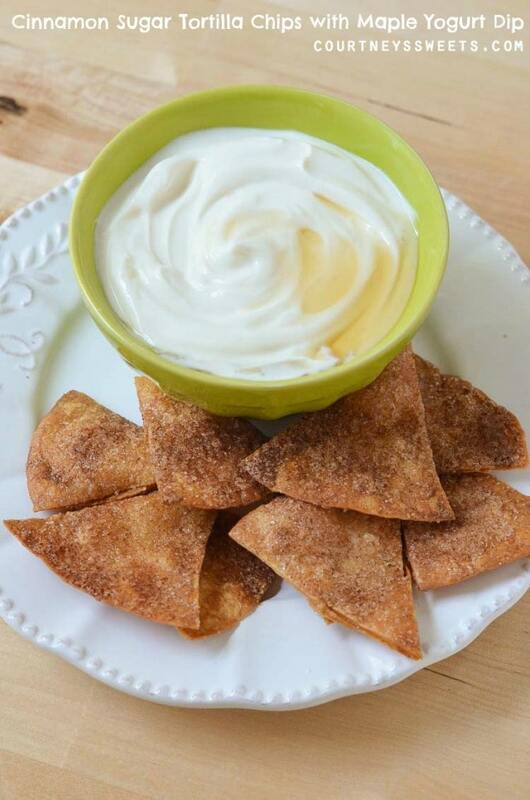 Cinnamon Sugar Tortilla Chips with Maple Yogurt Dip – Super Simple Quick and Easy Recipe for Toddlers to Make! 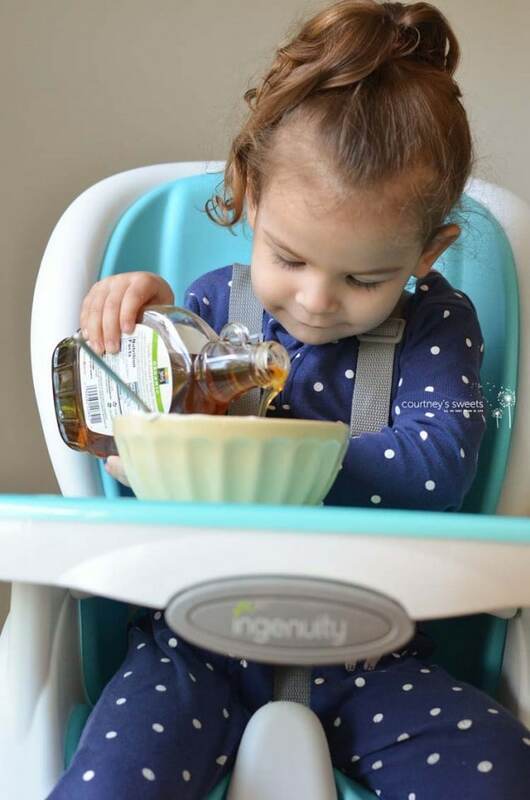 Just last week we share how we used our Ingenuity Trio 3-in-1 SmartClean Highchair to make our Homemade Maple Yogurt Recipe! 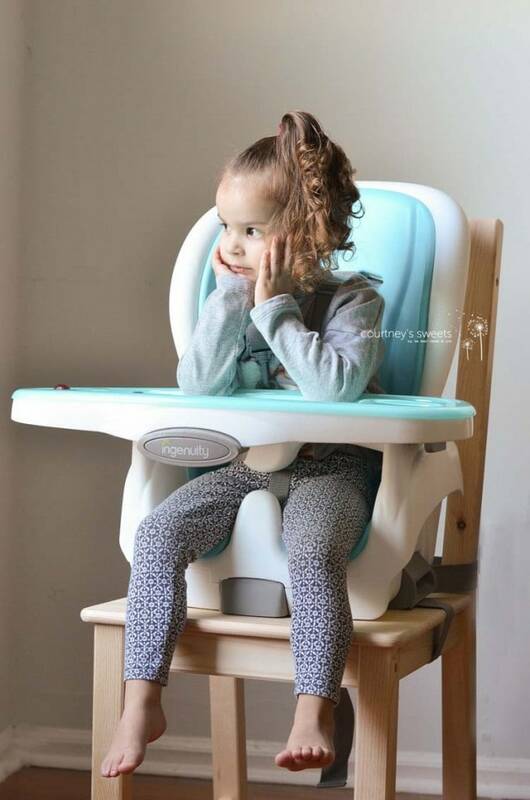 We told you all about how affordable and versatile this highchair is and now we’re showing you how much we love it as a toddler chair! 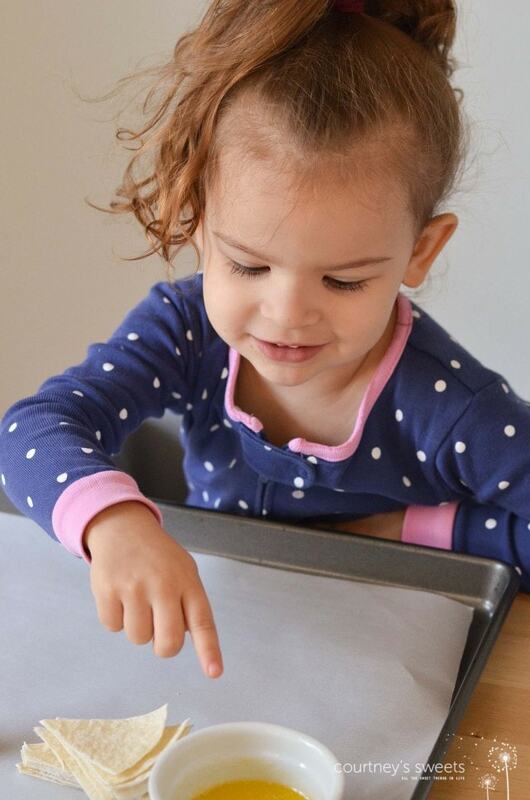 The toddler chair really allows my daughter to get close to the table and really into whatever we’re doing! 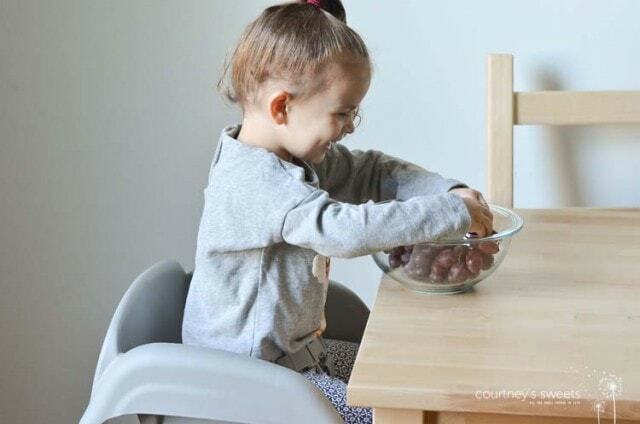 You cannot beat this highchair for under $100 – I love it for that price just as a toddler chair! 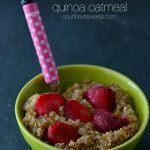 You can find it at my favorite retailer ever, Target! The height of the toddler chair fits our table perfectly. I just wheel it up to the table and she’s off doing her thing! This day she was helping me take grapes off the vine to make homemade grape juice! So what are we making today? 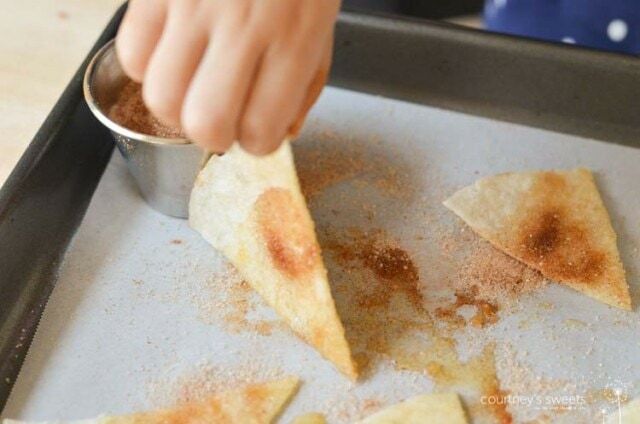 We’re showing you how to make Cinnamon Sugar Tortilla Chips. 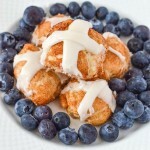 These chips are the perfect match with our Homemade Maple Yogurt recipe. 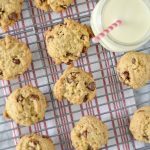 You can eat them on their on if you’d like too. 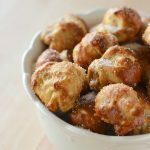 The possibilities are pretty endless with this crunchy, sweet treat. 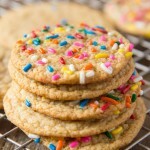 They’re homemade with tons of love, from my little love! As soon as I have the table set and ready for her to cook she’s jumping for joy to get into her Ingenuity toddler seat. She’s definitely hands on when it comes to cooking and that makes my heart so happy. 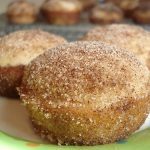 I love to be in the kitchen, especially with her! 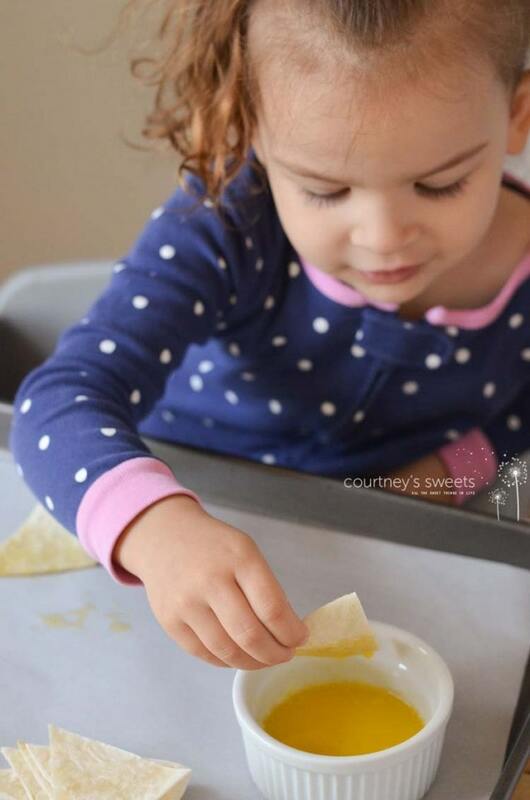 She couldn’t wait to dunk the tortilla triangles into the butter. 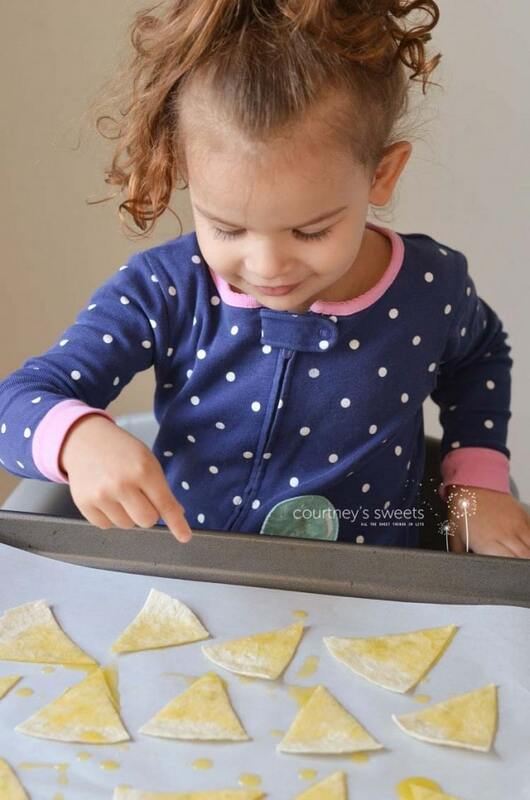 Once she’s dunked all of the tortilla triangles she sprinkled on some cinnamon sugar, flipped and sprinkled on more! 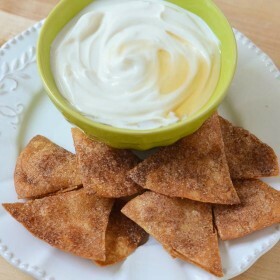 Yum we’re about to have some Cinnamon Sugar Tortilla Chips! 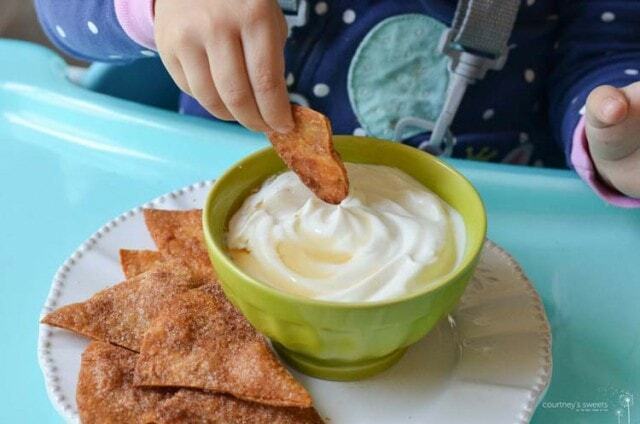 Cinnamon Sugar Tortilla Chips with Maple Yogurt Dip - Super Simple Quick and Easy Recipe for Toddlers to Make! 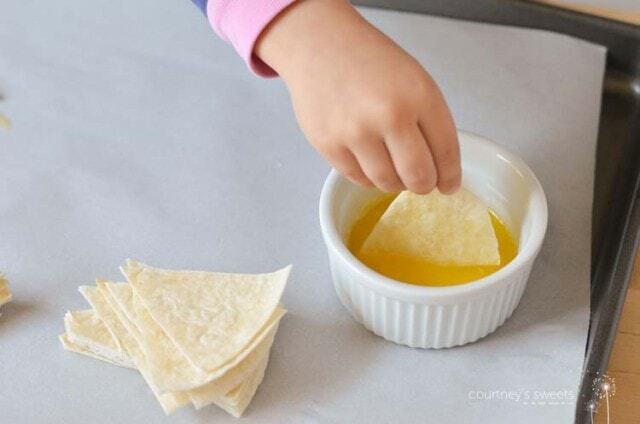 Dip or brush the tortilla triangles with butter and place onto parchment paper. 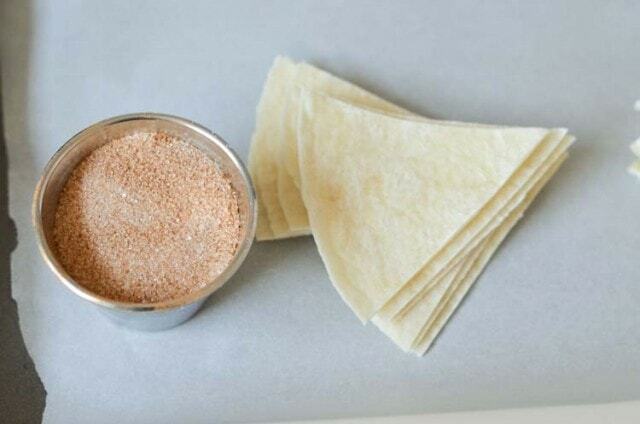 Once all the tortillas are coated with butter sprinkle cinnamon sugar onto both sides. 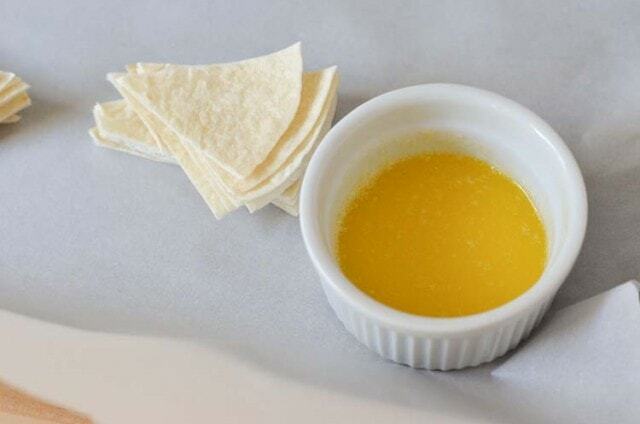 Bake tortilla chips for 10-15 minutes or until crispy. 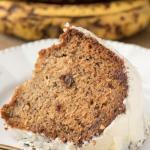 Don’t be sad, we’ll be sharing more toddler made recipes soon!